This one for the Guinness Book of World Records !!! 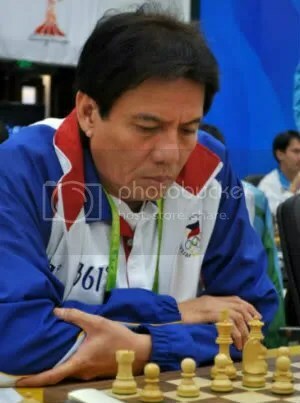 Then again, Asia’s First Grandmaster (AFGM) Eugene Torre, born November 4, 1951 in Iloilo City, is on the threshold of breaking his own & Hungary’s GM Lajos Portisch 20 non-consecutive Olympiad record when he is scheduled to participate in the 40th World Chess Olympiad in Istanbul, Turkey this coming 27 August to 10 September 2012. For the record, this would be his 21st non-consecutive participation in the World Chess Olympiad at age 60. Previously, in 2006, he also broke Finland’s GM Heikki Westerinen 18 consecutive Olympiad participation by registering his 19th consecutive (1970-2006) at the 37th Chess Olympiad in Turin, Italy. 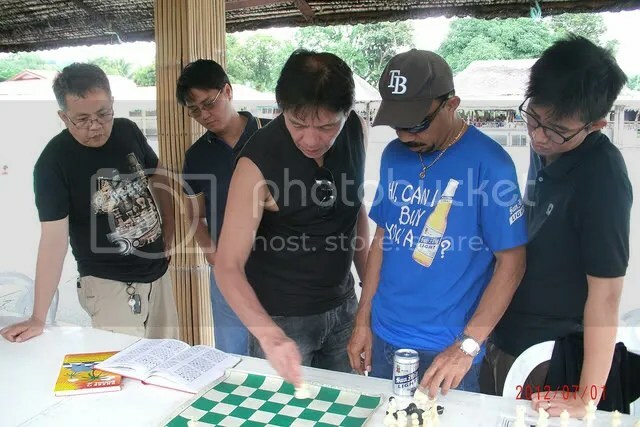 Additionally, AFGM Eugene Torre also registered his 17th consecutive record (1972-2004) as Board-1 or Top Board player in the Chess Olympiad. This he achieved in the 36th Olympiad in Calvia, Spain (2004). In his 20 participation at the Olympiad, Eugene Torre had played in 243 games (89Wins-114Draws-40Losses) scoring 146.0/243 points. His topnotch performances were winning *3-Bronze medal as Top Board (Board-1) player in 1974, 1980 & 1986. I. 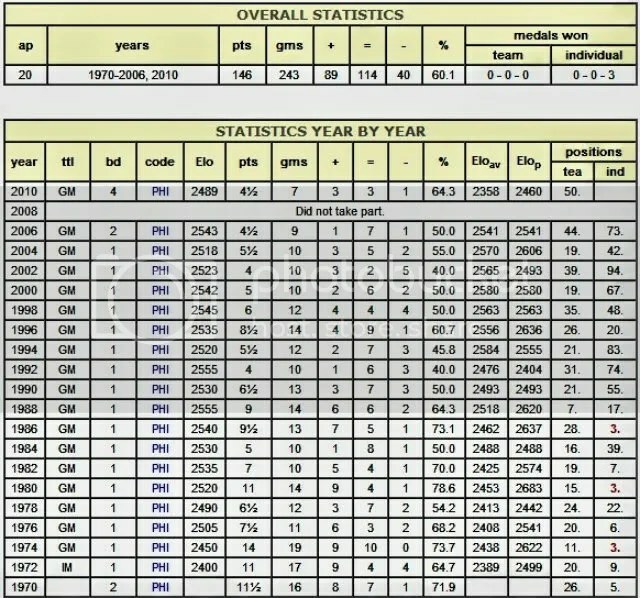 1974 (21st Chess Olympiad) : 9Wins & 10Draws scoring 14.0/19 points for a 73.7% performance. III. 1986 (27th Chess Olympiad) : 7Wins-5Draws-1Loss scoring 9.5/13 points with a 73.1% performance. In 1988, Eugene Torre lead Team Philippines to its highest ever 7th place finish in the World Chess Olympiad in Thessaloniki, Greece (28th Chess Olympiad). 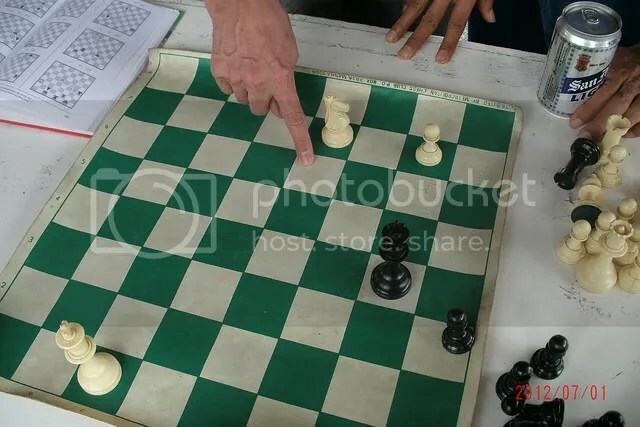 This broke the previous 11th place finish in 1974, the 21st Chess Olympiad in Nice, France where he also led Team Philippines. Addendum: * But in our (BW-GETS) August 11, 2012 interview with AFGM Eugene Torre, he said that he got a SILVER MEDAL in Board-1 in the 1974 ‘Nice’ Chess Olympiad, instead of a Bronze as published by OlimpBase, behind GM Anatoly Karpov who got the Gold medal. The silver medal is in his position and in fact it was all over the media during that time. Additionally, he added that OlimpBase should rectify this. GM Eugene Torre’s Top Secret … Now It Can Be Known !!! What was AFGM Eugene Torre’s secret weapons before and during the 2012 National Chess Championship : 5th BOGM … now can be known ! Yes, his human cluster was actually fairly impressive too! He did had a HUDDLE, REVIEW & GAMES ANALYSIS with his longtime Philippines Olympiad ‘buddy’ & teammate NM Eduardo Bernal (1980 & 1984) i.e. Old & very reliable openings and as described by master Ed as their ‘Pansol study’ ! But of course, PLUS + PLUS + PLUS INVALUABLE & ABLE SUPPORT of GM Eugene Torre Supporters (GETS). MABUHAY !! !